Not all cars take kindly to CNG installations and not all CNG installations are successful in the long term, so it’s important to consider these points right at the start. LPG vs. CNG – which is better? There are two kinds of CNG kits that are available in the market. One is the venturi type of kit which is ideal for older cars – and cars that have a carburettor instead of an MPFI system. Buses and trucks that have been converted to run on CNG have this kind of system, as they use a rudimentary carburettor system, where the CNG mixer directly dumps gas into the top of the throttle body of the carburettor. The second, and the more recommended kit for modern cars, is the sequential CNG kit, which is more expensive than a venturi- based system, but it is more precise and gives much better running characteristics than the older system. The sequential kit consists of a separate set of gas injectors and an ECU that controls gas flow by connecting with the car’s existing petrol ECU. The second most important point to consider is the size of the CNG cylinder. Commercial vehicles have the space, and so many of them have multiple CNG cylinders to give additional range. You will see buses with between 4 and 6 CNG cylinders which give them extended range. However, in a hatchback boot space is limited. And CNG cylinders unlike LPG cylinders are much larger as they have to withstand much higher pressures than LPG cylinders. 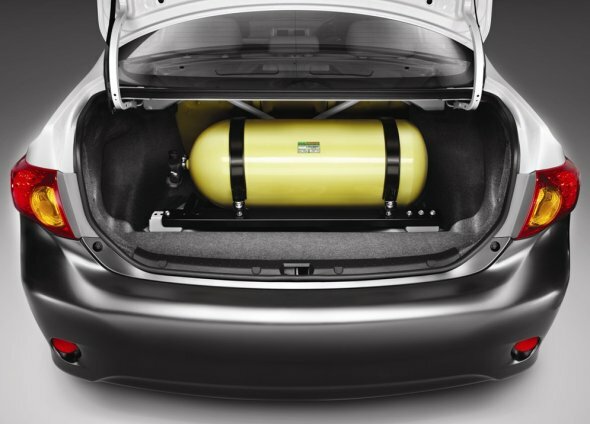 CNG cylinders are available from small 14 KG cylinders all the way up to 60 Kg cylinders. These can take up your entire boot space, so decide if you want extra range on CNG or you need some luggage space and fit accordingly. The third point to consider is whether you are going in for an open-loop or closed-loop system. This also ties in with the first point, on the kind of CNG kit that is being installed. A closed loop system has additional inputs going to the CNG ECU from the lambda or oxygen sensor which then regulates gas flow to control exhaust emissions. This is a greener system than an open loop system, that does not sense exhaust gases. The problem is that not all closed loop systems generate good enough power – as sometimes power is compromised in the interest of exhaust emissions. The fourth point to consider is the brand of the CNG kit. Lovato, BRC from Landi Renzo, Zavoli, Tartarini are all some good brands to consider, but first check with the CNG installer if it can be installed in your brand of car. For instance, Honda cars don’t take too kindly to CNG installations. CNG engines tend to run much hotter than normal engines, and hence there are some components such as intake valves and gaskets that can fail prematurely. One needs to check if these can be upgraded. Other cars have weak rear suspensions that can’t take the constant load of a CNG cylinder. For this too, there are suspension pads or spacers that are offered that can strengthen the car’s suspension. Always check what kind of warranty your installer is going to offer you on a CNG kit. Most kits come with a 1 year replacement warranty, but installers also throw in a life-time or 5 year tune-up warranty, which will allow you to take your car in for any repairs anytime. Some dealer-fitted CNG kits will not void your cars manufacturer warranty, but some brands won’t honor a car manufacturer warranty once a CNG kit is installed. Do check with your car dealer about this. Do share any more points you have about things to consider when installing a CNG kit.